When managing a large fleet of assets across numerous sites, making sense of the streams of operational data from multiple systems and from remote sources can become an impossible task. Most utilities today are using real-time historians to consolidate disparate data sources for a more comprehensive view of plant performance. Building on that data management foundation, predictive asset analytics solutions can leverage data from the historian to further improve operations by providing early warning detection of equipment issues before they lead to failure. To achieve the next level of operational efficiency, companies are investing in predictive maintenance programs, including the implementation of predictive asset analytics software. The first step in implementing a predictive maintenance program is having the data management foundation in place. At most utilities, relevant asset information is typically stored within a historian. The historian captures and archives continuously streaming real-time data from any type of asset or system, regardless of manufacturer. This is beneficial when maximizing the usefulness of time-series data that is often most relevant in real time. A single data management system ensures that all necessary information can be made available and compared with other data streams quickly and accurately. This increases situational awareness and builds the foundation for holistic visibility of the entire enterprise. After ensuring that a solid data management infrastructure is in place, companies can implement predictive analytics software that uses continuously streaming time-series data for real-time insights. Predictive asset analytics software helps organizations improve operational performance by using predictive algorithms to calculate and predict normal asset behavior. Schneider Electric’s Avantis PRiSM software is based on advanced algorithms that use advanced pattern recognition and machine learning technology, which has been shown to provide weeks to months of early warning notification of deviations in operational performance in power plants. One electric utility in North America uses the Wonderware eDNA real-time historian to manage generation data across seven sites. The highly available historian uses lossless data compression to quickly store and retrieve operational data. The data management infrastructure enables efficient sharing of information between systems, applications, and users. The eDNA historian is also integrated with PRiSM, enabling advanced pattern recognition and machine learning to identify when equipment is not operating as expected during all ambient, loading, and process conditions. 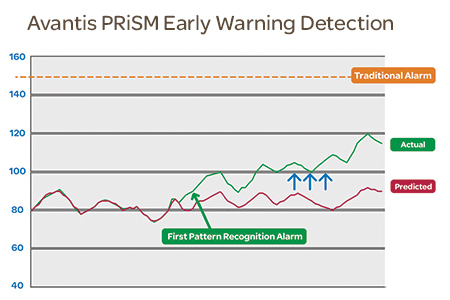 In one early warning notification, PRiSM first alerted personnel of abnormal conditions in the Overall Model Residual (an indicator of overall system health) and alerted again on individual vibration sensors. The plant staff was notified, and vibration technicians inspected the issue. Analysis of field data indicated fan support issues, with similar fans experiencing the same issue to a lesser degree. The utility was able to continue running the equipment with increased supervision and scheduled an inspection with the fan manufacturer during the next planned outage. The support system was corrected on all fans during the planned outage. With the early warning notification, this utility was able to resolve the issue before it substantially damaged other asset components and avoided a forced outage while also improving equipment performance. Developed robust data archive and retrieval architecture for reliable access to real-time and historical data. Created interactive display screens for improved visibility into operations. Developed accurate and standardized reports, reducing the time to produce them. Identified early indications of asset failure while improving reliability and safety. Learn more in this industry solution paper.